Washington artist Rockne Krebs (1938-2011) was an international pioneer in using light, specifically lasers and neon, as an art medium. After serving in the Navy Reserve from 1962-64, Krebs came to Washington from his native Kansas City. While in the Navy, Krebs learned celestial navigation, a method of finding one’s position on land or sea using a sextant to measure a vertical angle from the horizon to a star, the sun or the moon. This experience inspired the artist’s interest in light, and led him to experiment with lasers as early as 1968. His early light works that shot colored laser beams in linear arrangements across vast spaces might be seen to have given form to the imaginary lines plotted from the earth to the stars that were part of the ancient reckoning method. His first major light work, Sculpture Minus Object (1968) led to his rising fame in the area, drawing critics, curators and scientists to his studio. Over the course of his career here, Krebs received over forty commissions for public art—some ephemeral and others intended to be permanent. Unfortunately, only four of these have survived. A widespread awareness of his accomplishments has also suffered from his absence from the metro area since 2001. In that year he sold his half of the building he had shared with Sam Gilliam since the 1990’s and moved to a rural town in Virginia. Since his death in 2011, his daughter, Heather Krebs, has been curating his artistic legacy, and was the source of the works now on exhibit at Hemphill Fine Art. In 1972 Krebs won a Guggenheim Foundation grant to pursue his experimental light works. However the grant allowed him time to create a series of works on paper that aimed at expressing the atmospheric and ephemeral qualities of his light works. These are the Smoke Drawings now on exhibit. Characteristic of his search for new media, Krebs developed a process for employing candle smoke as a drawing medium. The artist would set up a large candle and then manipulate paper above it so that the smoke, which moves in unpredictable ways, could be captured on the surface. In some of these works, the artist put down a primary arrangement of colors using airbrush, sometimes very freely and in others first penciled in geometric shapes. In some works, the color seems to have been added after the smoke layer. A few of the drawings are large scale, and many are quite small. But in every case, Krebs’ obsession with meticulous control of what went on the paper is evident, resulting in a remarkably elegant group of works that remain in the mind long after seeing them. The works are all Untitled (Smoke Drawing), extended only by the month and date. All of the drawings in this show are from the summer of 1973. 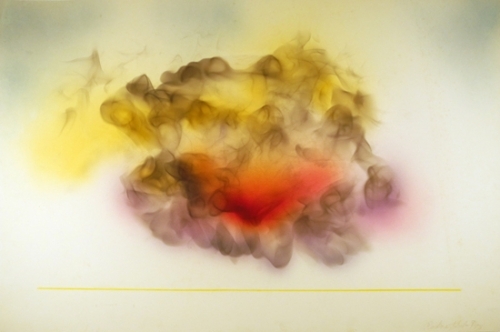 Three works are designated Untitled (Smoke Drawing) 9/73. The one illustrated here in a horizontal format is a good example of the elegance and compelling coloration of these works. This drawing, with its deep red center and it smoke ring might remind a viewer of a volcano, or hot spring. It reminded me of Leonardo da Vinci’s deluge drawings, with an added element of color. A single yellow line underscores the central form that seems to churn and move as one looks at it. Another with the same designation has chevrons lightly airbrushed as the first layer in tones that include a deep turquoise transitioning to orange and yellow carried out with exquisite softness. The gray smoke moves over this in curls and eddies, tracking the movement of the paper in the artist’s hands. A small piece from 8/73, a 9 7/8” square, is limited to the smoke, as are a few other small ones in the exhibit. Two branches of smoke come from the corners to meet in a flurry of forms in the center. The image is evocative of many things, from microscopic animals to galaxies meeting in deep space. This iconography seems to permeate all the works, alluding to both the microcosm and the macrocosm simultaneously, capturing the chance movements of the medium that mimic nature’s simplicity and mystery. Also on view in a separate space at the gallery are a group of six works by contemporaries of Rockne Krebs in Washington DC including Sam Gilliam, Gene Davis and Thomas Downing, Leon Berkowitz and Alma Thomas. An acrylic on paper by Anne Truitt, similarly titled by its date, 24 Oct. ’71, is a deep orange with fainter orange lines overlaying the ground in spaced intervals. The tactile sense of surface that the artist achieved in this simple and small (23” x 30 3/8”) painting is extraordinary, reminding one of the lure of minimalism. In contrast, however, the richness and depth of Krebs’ Smoke Drawings, with their baroque swirls seem forward looking and their appeal is universal.